When you think of a spa, what immediately comes to mind? Massage? An upright jacuzzi with a gorgeous hot tub cover? Facials and scrubs? For me, spa is synonymous to relaxation which has been a luxury to me ever since I started accepting writing projects. Yesterday, however, I found my little piece of heaven right in the heart of Makati City. 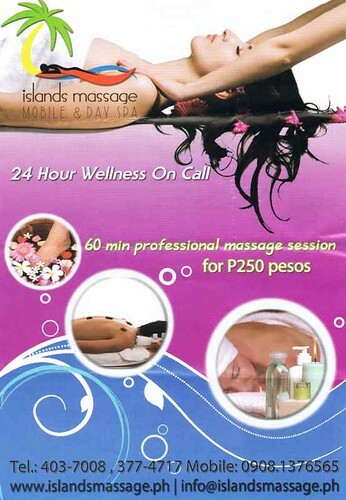 Islands Massage Mobile and Day Spa offers massage services and other beauty and wellness treats. Nestled in the busy N. Garcia Street (formerly Reposo) in Makati City, it becomes the perfect haven for the tired and stressed working people of the nearby business district. 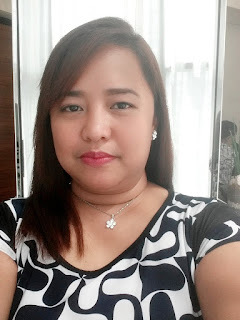 I was blessed to have been invited by the owners, Janice and Boogie, to review their spa. Yesterday was a rainy one so it was the best time for me to get a full body massage. I can say that I'm already an expert when it comes to massages because my husband and I get massages every other weekend. I was given the Swedish Massage which is my favorite. (My husband hates oils so he always prefers Thai massage.) I didn't get the name of my masseuse but I truly enjoyed her massage. The pressure was as light as I instructed it to be. I also didn't know what kind of massage oil was used on me. I was told after the service that I can choose my preferred massage oil from their collection. Oh well, maybe next time. 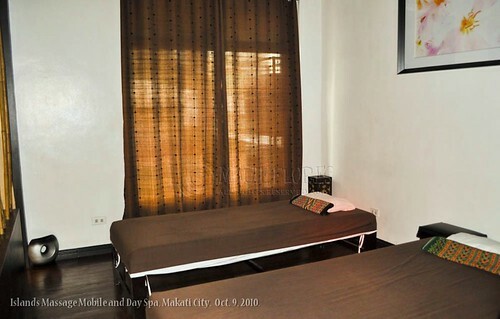 What I also loved about Islands Massage Mobile and Day Spa is the wide and comfy bed I laid on. The bedding smelled good and the towel and robe I used were soft and fresh. I made a conscious effort not to sleep during the session because I would need to recall the whole experience for the review, right? 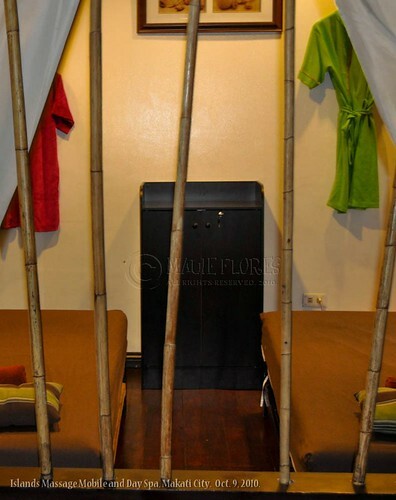 It was also surprising to see how spacious and stylish the massage rooms were. If you are a "suki" of day spas, you'll know what I mean. Other day spas I've been to either have mattresses on the floor or small beds confined in cubicles. 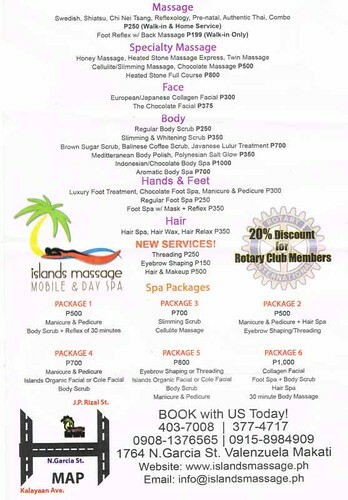 Islands Massage Mobile and Day Spa is a complete one-stop, full-service 24-hour home massage and day spa. 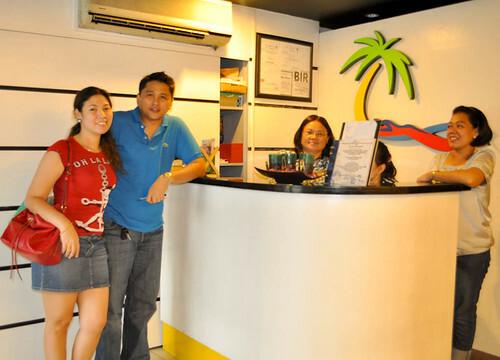 They can provide service to Manila, Makati, San Juan, Pasig ,QC, and Paranaque areas. You can also contact them if you want to have a private spa party with friends and family. The massage was great, foot massage is a little rough (sore soles and peeled skin with wounds). But beware of leaving your things for: 1) they don't have a changing area (you have you undress on the massage room, open to 3-4beds) 2) no lockers to put your bags or valuable things (of course what if you fell asleep on your massage) 3) leaving things behind. 4) my daughter took her shower in the CR/toilet which has little or no space for shower (the toilet was flooded with water after). 2 days ago my daughter and I had our massage from our metrodeal voucher. The massage therapist told me to remove my watch, while we were already more than halfway on the service. Anyways, after the massage, get dressed, left the SPA 6:30, and just remembered after 30mins on my way back home. I called them up several times, to ask if maybe it was left on the bed, or fallen off the floor. This Maricel on the reception kept on saying pls call back, for they still have customer, or the therapist is on service. Calling from 7pm-10pm after 4-5 phone calls, they gave me this answer that no watch was seen or left on bed. I told her that the watch is not expensive, but since my daughter gave this to me last Christmas, I just wish somebody would be nice enough to return it to me. I don't want to point at anybody, but for sure the cleaning lady after my SPA service saw the watch, if not, imagine having a bed uncleaned and to be in used by the next customer, is unlikely to be a hygienic SPA at all.